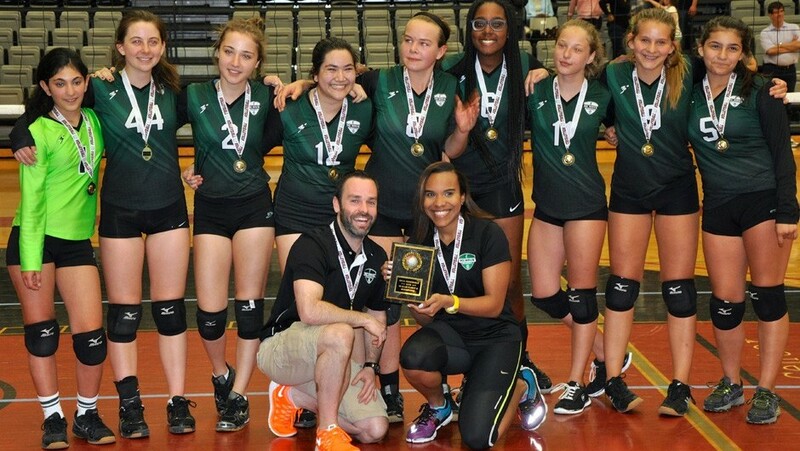 The Asphalt Green Wave 15U Volleyball Team had an impressive showing at the regional playoffs at Ramapo College in Mahwah, New Jersey. Held on April 18, the team went 3-0 in pool play to earn a No. 1 playoff seed. They continued their winning streak and were victorious in both playoff games to win the 15 Club Flight 3 championship. The Asphalt Green Wave faced Sideout Sports from Fairfield, New Jersey, for the championship crown. Kendall Chapman dug the team out of 23-17 deficit in the first set of the championship game with 8 straight service points for the win. The girls’ high-energy style of play throughout the tournament propelled them to the championship title. They remained focused and held their composure even when they didn’t have the lead, ending the GEVA season on a high note. Next up for the Asphalt Green Wave 15U team is the Happy Volley Tournament at Penn State University May 23-25. Congratulations on winning the GEVA 15 Club Flight 3 championship!